Russian Helicopters Press Release – Russian Helicopters, a subsidiary of Oboronprom, part of State Corporation Rostec, will showcase new and innovative models of helicopters at the Latin American exhibition and business aviation conference LABACE 2014 (Latin American Business Aviation Conference and Exhibition), to be held from August 12 to 14 in São Paulo, Brazil. Experts and representatives of regional operators will share their experience of operating Russian helicopters Mi-171A1 and Ka-32A11BC, which have already been used effectively in South America for a wide range of tasks. 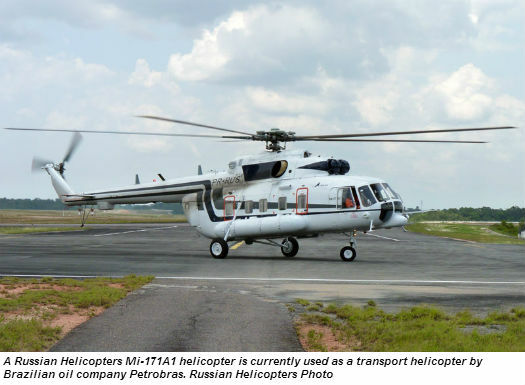 Russian Helicopters annually reports steady growth in demand for its products in the South American market, which is one of the fastest growing in the world. At the beginning of 2014, Russian Helicopters’ fleet production exceeded 400 units. Today, Russian Helicopters is widely represented in the class of commercial helicopters, with a maximum take-off weight of 10 to 20 tonnes, taking up a 77 percent stake in the regional fleet in this segment. Russian helicopters are used for military purposes in a number of countries in Latin America, and make up the basis of army aviation fleets. Participation in the LABACE 2014 exhibition will allow Russian Helicopters to introduce the latest Russian helicopter sectors to regional partners in Latin America and the Caribbean, strengthening mutually beneficial cooperation and establishing new business contacts.